Dan and I love mojitos. And since we’re pretty much home-bodies, we like to learn how to make the cocktails we would usually drink out in the scary, noisy world, inside the comfort of our living room. 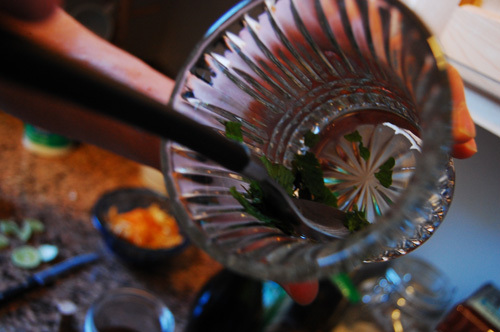 A mojito is ten times better when enjoyed in fuzzy socks. 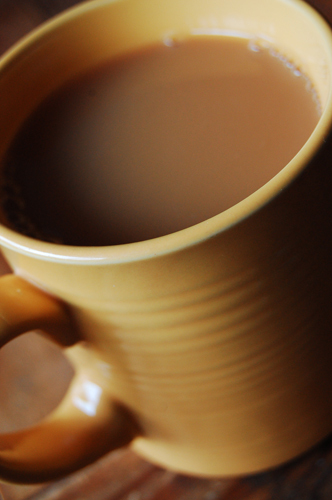 Boil your water and sugar until the sugar is dissolved. Set the syrup aside to cool. 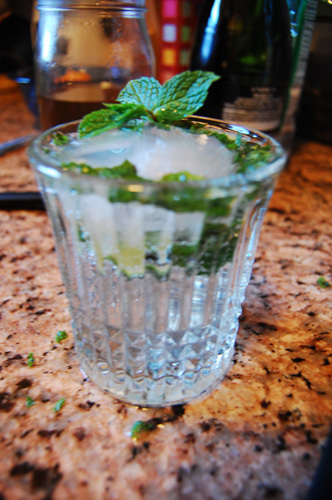 In your glass, crush mint and lime. Pour in your syrup and rum. Top with tonic and ice. Serve and enjoy. I will be up front. I hate being cold. I loathe winter. But I do love being inside, listening to Christmas carols, and drinking apple cider. I’m totally fine with snow as long as I’m inside and it remains outside. The second I have to don the GoreTex coat I got one year in college for Christmas (not the pea coat I asked for), I get cranky and upset. So when our local farmer’s market started selling apple cider, I started feeling happier, despite the rapidly decreasing temperature. Now I’ve watched enough Food Network and read enough food blogs to know that you can’t serve something straight, you need to tweak it to make it unique. Except a Bojangles chicken biscuit. You eat that bad boy just as it is, don’t bother with it. Anyway, with apple cider you are taking a delicious base (the cider) and adding spices and just a little fruit to make it the embodiment of liquid holiday. I suggest adding allspice berries, cinnamon sticks, sliced oranges, and whole cranberries. Mmmmm mmmm, yummy. It almost outweighs the cold. Almost. Put a large pot over heat. Pour in cider. Add fruit and spices. 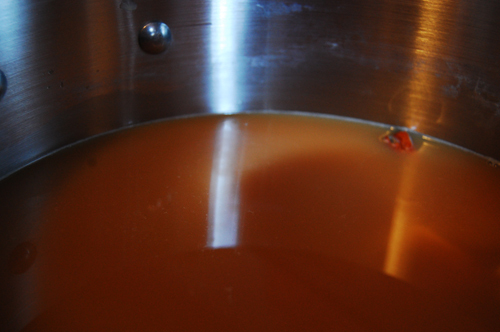 In order to fully incorporate the flavors, you want to scald the cider, bring it to almost a boil. Lower the temperature and simmer until you’re ready to serve. Every year for the holidays, my Aunt Lori makes a green bean casserole. Now she’s the first to admit that the recipe is from the side of a French’s Fried Onion can. But I refused to make it myself, and I worshipped that casserole. One of the unfortunate things about learning to cook your family’s famous dishes is that you learn the secrets. For instance, I was never able to eat meatloaf after my mother made me make it for the first time. Anyway, when I set out to prepare my first solo Thanksgiving, I was planning on making my Aunt Lori’s green bean casserole. Then I started looking into what that included. Now, keep in mind that I’m happy to make a butter-heavy dish if I think it’s worth it. And if it’s the only heavy fat dish I’m making that meal. After careful consideration of what else I was serving (turkey, sweet potato casserole, crescent rolls, pumpkin pie, and cranberry sauce), I just didn’t think the calories were worth it on a side dish. So I started looking into alternatives. 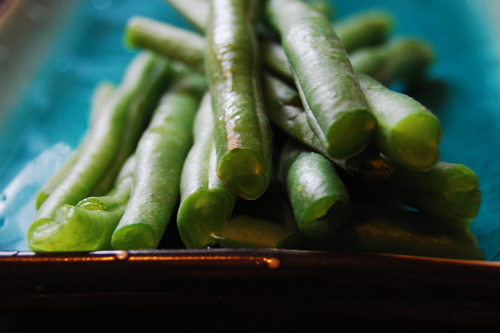 I had already bought the green beans, and while a can of french fried onions can waste away in my cabinet for years, I wasn’t wasting fresh green beans. So I perused the internet for a recipe that sounded good. It was a bust. For one, half the recipes I found were for the same 300 calories a serving casserole I was running away from. The rest either included tomatoes (not the right season) or sounded unappealing for a variety of other (I’m too picky) ways. So I decided to fly by the seat of my pants, taking things I liked from different recipes here and there. 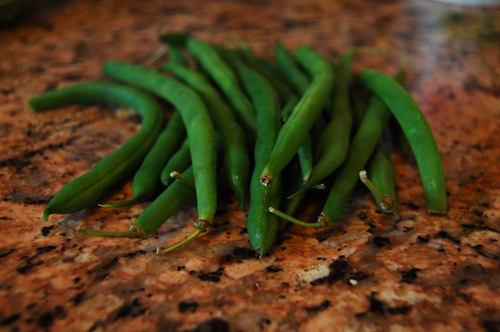 For instance, Rachel Ray had a recipe where her green beans were cooked in apple cider. Others used apple cider vinegar. So I took those elements and made it my own. 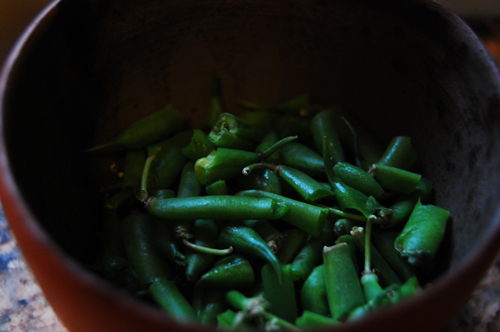 When I cook green beans, I like to boil them, then toss them lightly with butter and salt and pepper. With this recipe I tossed them in less butter, a small amount of apple cider vinegar, and a larger amount of apple cider. The result was light, crispy, and a good textural alternative to the other flavors on the Thanksgiving table. I will note that Dan was not a fan of this recipe. I don’t know how Megan and John felt about it, and Meredith only ate cranberry sauce and stuffing, but I loved it. 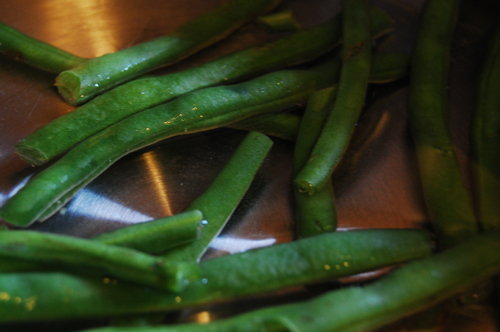 Clean and boil your green beans. When they’re ready they’ll be bright green, and will be crunchy to taste. But not so crunchy that they’re hard to eat. Drain and return to the pan. Toss in butter and apple cider. When the butter is melted, add salt and pepper. 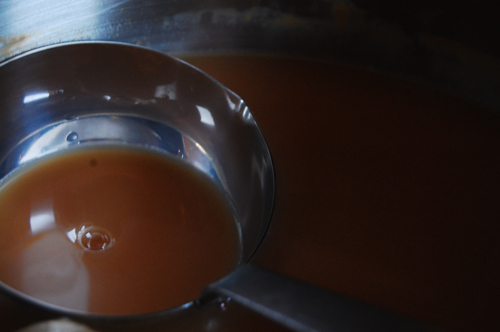 Pour in apple cider, and simmer for five to ten minutes. Serve in a bowl with juices.